I was a college kid back in the crazy 90s. This was also around the time I discovered how to add pictures with Microsoft Word - so being a Communications major, and a metal head (my high school term paper was all about subliminal lyrics in heavy metal). My final paper for a Media Criticsm class required I take a body of work and critique it - so of course who else would I choose but Iron Maiden? This was back in 1997 around the time of Best of the Beast. Blaze was still in the band and Bruce Dickinson and Adrian Smith were still 2 years away from rejoining the band. 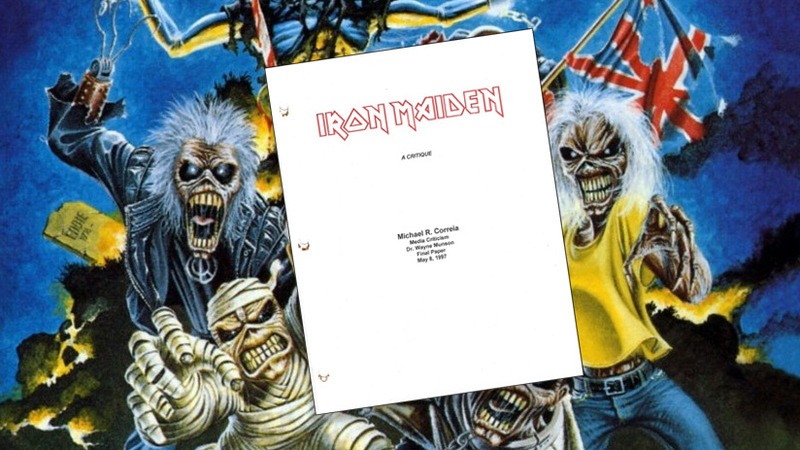 Since the writing of this paper, Iron Maiden has put out 5 albums (1 with Blaze, 4 with Bruce and Adrian back) with a sixth album coming out in four days. To commemorate this momentous occasion and to celebrate Iron Maiden week, I proudly present to you my B+ effort, "Iron Maiden: A Critique." If you don't see the above PDF document, you can view it here.